USB Extension Cable USB Extension Cables Version 1.1 and 2.0. Available in 6' & 10'. 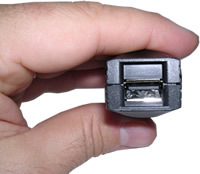 Use to extend a USB device such as printers, modems, scanners, digital cameras, etc. USB 2.0 16ft. 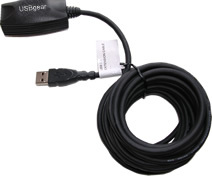 Active Extension Cable Repeater only $14.98 Works with Windows 7/Vista/XP/98/Me and Mac OS X. No setup configuration required, No Driver Installation, No IRQ Conflicts...Just plug your cable(s) into the 16 foot USB2.0 Extension Cable and you're ready to GO! The above diagram is a representation of how the USB2.0 extension cable functions. 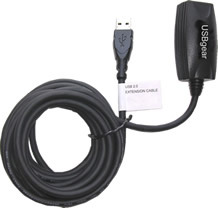 The GM-800-5M USB2.0 Extension Cable is not a passive extension cable. It's an active device allowing you to extend other USB cables. The USB signals going in and out of the extension cable are buffered to assure signal quality and the meeting of the USB2.0 Electrical and Timing Specifications. Using passive cables for the purpose of extension will result in signal errors and is not recommended. 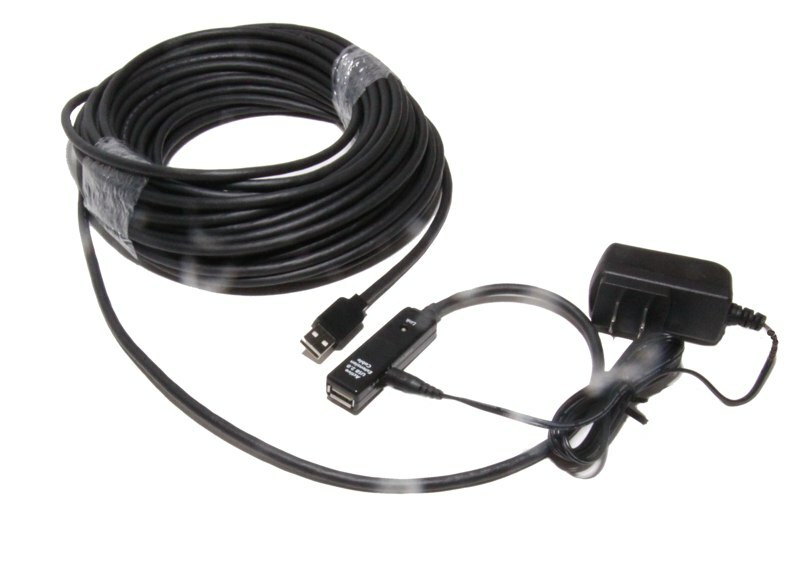 The GM-800-5M USB2.0 Extension Cable allows a USB device to have its cable length extended by up to an additional 40 to 80 ft. By connecting 8 and 16ft. cables in a serial fashion, The USB2.0 extension cable acts as a transparent USB hub and buffers both downstream and upstream data traffic. 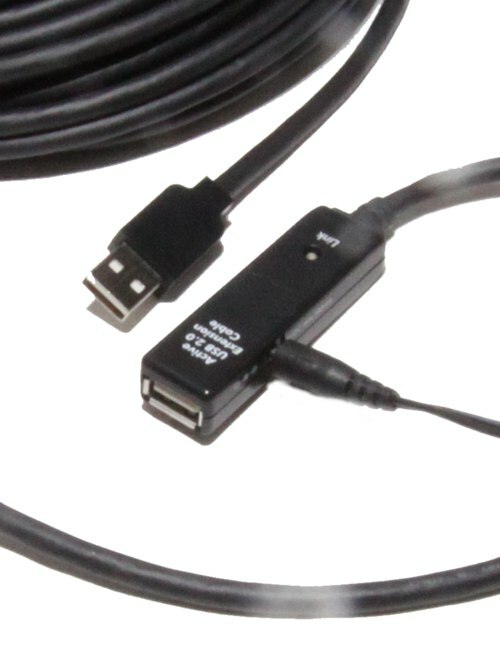 Both Low and High speed devices will function as well as if they were directly connected to a USB Port with the USB2.0 extension cable. Data transfer rate up to 480Mbps. IBM PC 486DX4-100 MHz or higher. Available USB 2.0 port (up to 480Mbps) OR available USB1.1 port (up to 12Mbps). Windows 98SE, Windows ME, Windows 7 or Windows XP. Windows Vista. This is the female end of the USB2.0 Extension Cable and the brains of the operation. This is what delegates the USB signal when connecting several USB2.0 extension cables in series or connecting one peripheral USB cable to the extension. The standard USB cable length is about 5 meters, the USB extension cable or data extension cable as it is sometimes called does as it's name implies and extends or repeats the length of the standard usb cable, or the length of data signal to its destination peripheral or hub. This particular cable is 16 feet long. SIMPLE is as SIMPLE does! All you have to know about USB is how to plug it into your USB Port and the usb2.0 extension cable takes care of the rest. I tested this with my PhotoSmart printer and it's 5 meter cable. I was in the living room and the printer in the kitchen, about 20 feet away. I very simply connected the female end of the repeater to the USB printer cable and the male end to my laptop, printed a document in no time flat just as if I was connected directly to the printers USB cable. This opens up possibilities for me as I work out of my living room. This is a home office must and will certainly allow you more options when it comes to setting up a home office with your USB peripherals. I would certainly recommend this product to those who need to extend their USB cable and signal. New Industrial Duty USB 2.0 Extension Cable with AC Power Adapter for Power Boost, This is a single run 65ft. Cable with A-Male Port to A-Female Port that works with ALL USB 2.0 Devices, this cable requires AC power at all times to Clean the USB 2.0 Signal and provide a very long extension to Cameras, Smart boards, scanners, printers, keyboards, dispaly adapters, serial devices etc.